Today, I’m going to show you how to use stencils for quilting. Coming up with a plan for the quilting design can be a challenge. Sometimes it’s a complete mental roadblock when I try to decide on a design. I often fall back on a crosshatch or grid pattern or I just stitch in the ditch. Sometimes it depends on how much time I’m willing to spend on this stage of the process and what (and who) the quilt is for. Here is where stencils can come to the rescue. Quilting stencils are typically made from lightweight plastic that is slightly opaque. I purchase stencils when I can find them in quilt shops (which is not too often). The good news is I have found a great online resource for stencils at The Stencil Company. They have a great variety of stencils ranging from border designs to quilt block designs to background designs and more. They also carry preprinted wholecloth, paper pantographs and notions. Here it is after quilting (and still no binding). What a difference the quilting makes! I used stencils for everything – even the straight lines. Here are some tips and guidelines when using stencils. SIZE: I think the most important part of picking out a stencil is choosing the right size stencil for the area you want to quilt. The design should fill the area completely or almost completely. Let’s take a look at the gold triangles near the center of my quilt. I found the perfect size stencil for this area. It reaches the corners and edges nicely. For the larger, orange triangle corners, I didn’t have the correct size stencil. This same stencil doesn’t fill up the space adequately. For the center of my quilt, I had a few options. The stencil below was the right size, but I didn’t want the heart theme. I love clam shells and this stencil was exactly what I was hoping for. It’s the right size, but I knew it would be since I “built” my center block with this stencil in mind. My squares are 2″ just like the spacing of the clam shells. You could use this design with anything, though; it doesn’t have to be pieced or symmetrical. I’ll show you how I modified this design in a little bit. A few years ago, I made a sample quilt for a class that I was teaching. I wanted something simple for the border so I used a small cable stencil. It was way too small for the width of the border. I don’t have a “before” picture to show you, but I can tell you that I found a solution. I encased the cable with straight stitching lines on each side, making it look like a border within a border. It worked out well. This technique could be applied for any area that is too big for the stencil you have. Enclose it with straight stitching lines and it becomes a separate element. When choosing a border stencil, you may have to adjust the size to fit your border. I don’t have a good example to show you, but I can tell you there will be a repeat in the design that may not match your quilt’s dimensions. A little math is involved here and a little luck, too. You can check out this blog post by Nadine at Fabric Bias for more information. The border stencil that I chose fit my quilt well enough. Because of the cornerstones in the quilt border, it was easy to make the border pattern fit. I ended the pattern after the diamonds. 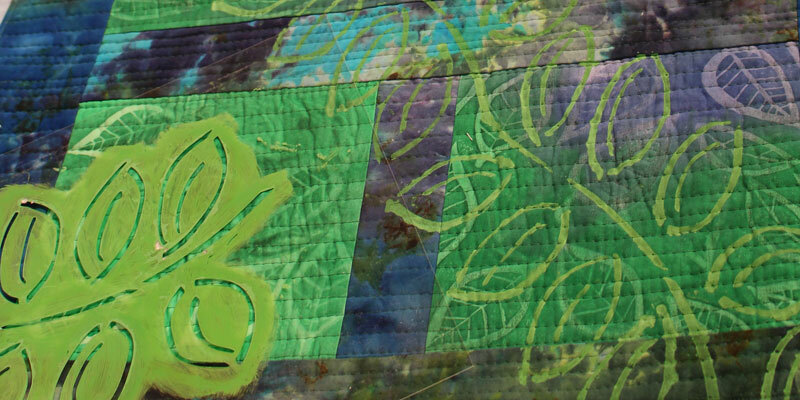 Some border stencils have a corner built into them so you can maintain the design all the way around the quilt’s edge. STRAIGHT LINES OR CONTINUOUS CURVES: Most stencils are geared for continuous line quilting using free motion quilting techniques. Once in a while, you’ll find a stencil design that requires stopping and starting again in a different place. This isn’t such a problem for hand quilters, but for machine quilters it’s something to consider and be aware of. Often, you can create a continuous line by adding in a loop or a curve of your own. The idea is to keep stitching without having to stop and start often. Maybe you’re not an expert at free motion quilting and you would rather use your walking foot and quilt straight lines. That’s o.k.! There are plenty of grid-based designs. Some cables have soft enough curves that you can use a walking foot easily. That’s exactly what I did with the border stencil design. MARKING: You can transfer or mark the design onto your quilt top by using any of the following: chalk pencil, water soluble pen, Quilt Pounce, graphite pencil, or a Hera marker. I personally don’t recommend a Frixion pen for marking quilting designs, but I use it often for marking diagonal stitching lines for hst’s and such. You run the risk of a “ghost” line showing up, or the marks come back after it’s been “erased” by the iron due to temperature fluctuations. The nice thing about stencils is they can be used after the quilt is basted. Some methods of marking a quilt require you to trace the design onto the quilt top with a light box before basting. It’s your choice with stencils. My number one favorite marking tool is a blue, water soluble pen. I’ve tried many brands and they all work very similarly. I decided to try the pens offered by The Stencil Company and bingo! The Blue Water Erasable Markers are the best I’ve used. I bought the 4-pack and I’m so glad I did. They have a sturdy, long point that fits in the channel of the stencil perfectly. They have a great stream of “ink” and you can see the marks well. They are removed easily with water. I use a spray bottle filled with water to get rid of the marks from the blue washable pen. Sometimes the marks will come back in a few areas after the quilt has dried. I just wet them again until they disappear. If you’re really heavy-handed with the pen, it can seep into the batting of the quilt. This might require submerging the quilt in water and soaking it for a few minutes to get the marks out. Use towels to remove the excess water and lay the quilt out on a clean sheet and let it dry for a day (or two). It’s always a good idea to test any marking product first on a scrap of fabric to see how it reacts to the material. You’ll notice that stencils have gaps where you can’t continue the drawing line. You can connect those gaps after you’re done marking. This is sometimes helpful if you’re unfamiliar with the design or new to quilting. Now comes the hard part – quilting. Not really so hard when you have lines to follow! When you’re quilting a continuous line design, it’s important to be familiar with your stitching path. Some stencils will have a small diagram printed on it with arrows to show you the best path. Practice first on a piece of paper, dry erase board, or on a practice quilt sandwich. You can find more of my tips on free motion quilting. For the corner stencil in my example, I started stitching at a “point” in the design. This is a natural starting and stopping point and it will hide the anchoring stitches better than an uninterrupted line. I bring the bobbin thread to the top of my quilt sandwich and hold both thread tails as I start stitching to prevent a thread nest from forming on the back. When I get far enough away from my starting point, I clip my thread tails close to the quilt top. If I were making a competition quilt, I would bury my thread tails in the batting. If you make a mistake while your stitching, stop sewing and go back to where the mistake first started. Take small stitches to re-anchor and continue sewing. You can remove the bad stitches later. Our little kitten, Zoe, was the culprit for this particular mistake. She loves visiting me when I’m sewing! It looks like she’s about to have her paw become a permanent part of the design, but I had everything “paws’d” to take the picture! This particular design is one of those that requires backtracking. In order to have continuous stitches I had to backtrack over the top of every other feather. If you backtrack well enough, you won’t see it from a galloping horse! If you take a look at the center of my example where I used the clam shell stencil, you’ll notice that I changed the design. I didn’t like the directional design for this area of the quilt, so I turned the stencil in the other direction and added more lines. This changed it into orange peels which can be turned in any direction and it looks the same. There was a little bit of traveling involved with this design. I used the seam to travel to the next row of clam shells; it’s similar to backtracking. Stitching order: I almost always stitch in the ditch on my quilts. It adds stabilization to the quilt and it allows me more flexibility in where to start quilting. It also gives definition to the piecing and structure of the quilt. Note: I like to spray baste my quilts. It works well for me, and I love that I don’t have pins to work around. You can find a separate tutorial for my method of spray basting. I stitched in the ditch along the main seams of this project using a neutral thread (Aurifil 50 wt. color 5021). Sometimes I use invisible monofilament thread for this as well. Now, I’m able to quilt in the areas I want. Generally, I work my way from the center of the quilt sandwich to the outside edges. I saved the orange sections of this quilt to stitch for the end. I wasn’t sure what I wanted to do there and I thought I could make a better decision after the rest of the quilting was done. I’m glad that I chose straight lines for the orange corner triangles in this quilt. It’s possible to overkill a bit with stencils and I like the tailored look that straight lines can bring to a quilt. As I mentioned earlier, I used a grid guide to mark my lines. I hope I’ve answered most of your questions about using stencils with your quilts. They are a great way to add some zip to your quilting with ease.